Quality of life is an individual’s subjective judgment about his current position in some aspects of life that are important to him. 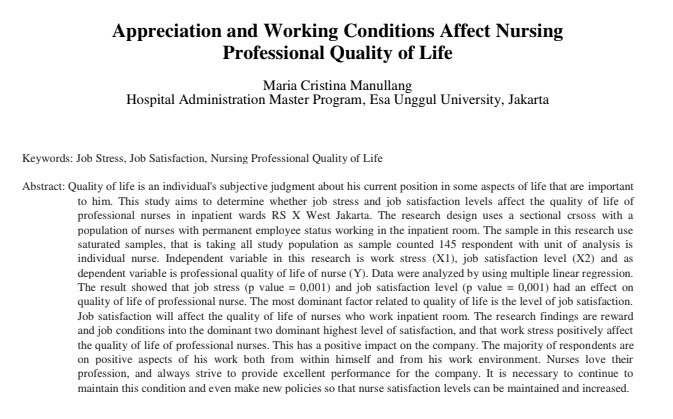 This study aims to determine whether job stress and job satisfaction levels affect the quality of life of professional nurses in inpatient wards RS X West Jakarta. The research design uses a sectional crsoss with a population of nurses with permanent employee status working in the inpatient room. The sample in this research use saturated samples, that is taking all study population as sample counted 145 respondent with unit of analysis is individual nurse. Independent variable in this research is work stress (X1), job satisfaction level (X2) and as dependent variable is professional quality of life of nurse (Y). Data were analyzed by using multiple linear regression. The result showed that job stress (p value = 0,001) and job satisfaction level (p value = 0,001) had an effect on quality of life of professional nurse. The most dominant factor related to quality of life is the level of job satisfaction. Job satisfaction will affect the quality of life of nurses who work inpatient room. The research findings are reward and job conditions into the dominant two dominant highest level of satisfaction, and that work stress positively affect the quality of life of professional nurses. This has a positive impact on the company. The majority of respondents are on positive aspects of his work both from within himself and from his work environment. Nurses love their profession, and always strive to provide excellent performance for the company. It is necessary to continue to maintain this condition and even make new policies so that nurse satisfaction levels can be maintained and increased.